Hey Shanny, Ya Blew It! Home/Featured/Hey Shanny, Ya Blew It! The NHL and League Disciplinarian Brendan Shanahan handling of player discipline has been nothing short of embarrassing in his tenure the past three seasons. From shallow decisions for certain teams and decisions that will make you scratch your head; it’s very troubling to understand how Shanny handles everything. Don’t get me wrong, his job is probably the hardest in the NHL, but the one thing you could ask for out of him is consistency. For those that may be living under a rock, I’ll take you on a journey of the inconsistency that Brendan Shanahan and the NHL Player Safety committee have demonstrated this season. These two hits were at the beginning of the season and had the same length of suspension but were both different in the sense one injured the other player and the other didn’t. Clearly it was a hit to the head, but if you tell me it was intentional I would argue with that. I believe the hit was an accident and wasn’t a clear intent to hit the head. But still a hit to the head is a hit to the head. The three game suspension wasn’t called for, although yes there was an injury on the play to Rick Nash, that hit happens way too many times during games and quite frankly it was a freak accident. But to send a message, a 1 or 2 game suspension would fit for Stuart. The aftermath of a hit from Alex Edler that nailed Tomas Hertl in the head. Clearly you can see Edler didn’t slow up on Hertl and nailed him with his elbow. Luckily Hertl didn’t get injured on the play and finished the game. In my opinion though Edler could’ve slowed up on Hertl and avoid hitting him, but he didn’t nonetheless. I believe the three game suspension was deemed worthy for Edler, but I think he could’ve got an extra game. Edler could’ve avoided the hit altogether and he didn’t. I think if Hertl did get a concussion from the hit, Edler would’ve been suspended at least 5 games. 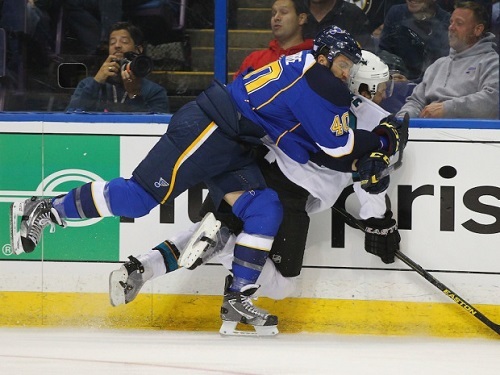 This was the same game Lapierre hit Boyle from behind and this hit was a little bit after it. As you can see from the video, you can see that Burns hit Morrow from behind in the numbers and sent him flying awkwardly into the boards, Morrow did leave the game for a bit but returned and finished the game. Not only didn’t Burns get fined for this hit, the league never even looked at it. How can the league not look at this hit and not at least fine Burns? Oh is it because Morrow isn’t injured or was it not a head shot? The intent to injure was there so why didn’t he get suspended? Burns should’ve at least got suspended 3 games for his hit from behind on Morrow. It was nothing short of clean and was just as dirty as Burns hit on Morrow. It definitely deserved the suspension and possibly an extra few games and I am not saying that because he’s Lapierre, I am saying it because there was an obvious intent to injure on the play. If you watch the video, you can clearly see Boyle’s head go awkwardly into the glass after Lapierre nailed him from behind. Lapierre easily could’ve avoided the hit and he didn’t, if you’re not going to avoid the hit, you deserve to do the time. Lapierre is notorious for dirty and late hits in the past and is definitely on the NHL Safety radar. Basically what I am trying to say is, I don’t care if you’re a star player, and if you’re injured or not. If there is CLEAR intent to injure the player, you should be sitting a few games. Just because the player isn’t injured and he’s a 4th line goon, that doesn’t mean you get off scot-free. 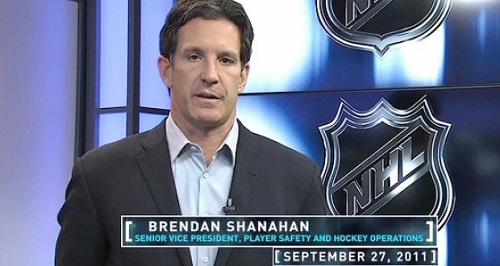 During his Tenure as NHL Safety boss, Brendan Shanahan hasn’t made a single effort to keep things at least somewhat consistent with his decisions. Shanahan has no credibility in his job which is still slightly higher than Colin Campbell before he resigned. What did the NHL say when Shanahan took the job? There would be more transparency and more consistency. I guess you can say they’ve delivered on that by giving you the bare minimum. All I am asking from Shanahan and the league is to keep it consistent, it’s not fair for teams, the players and the fans that they keep getting this garbage carnival guessing game from the NHL Safety Committee.